Apple has been defined by consumer product innovations such as transforming mobile phones from calling devices into data centers. But you won’t find Apple’s future in an Apple store. You’ll need to visit a hospital like Johns Hopkins Medicine. At Johns Hopkins, physicians provide epilepsy patients with Apple Watches to track their seizures, possible triggers, medications, and side effects. Thanks to a special app developed by Johns Hopkins, the EpiWatch, patients have access to their personal information through a dashboard that also shares data with providers if the patient wants to do so. Patients can also send a message to family members and providers to let them know when the patient is tracking a seizure. Johns Hopkins is collecting this data to eventually understand how to predict seizures before they happen. Johns Hopkins is one of many healthcare providers working with Apple to help patients manage their wellness and clinical care. Apple is not abandoning its role as creator of consumer devices and software — in fact, Apple is doubling down on devices by carving out a bigger role in healthcare. For the past few years, one of the world’s most valuable brands has acting as the data backbone for patient care, one built on Apple hardware and software. Having changed industries ranging from music to telecommunications, Apple is helping to the healthcare industry make an important and necessary shift toward wellness and clinical treatment. Apple’s strategy is to be the data backbone for patient care. And that patient care strategy — for now — focuses on wellness care (providing services such as fitness and nutrition management designed to keep patients healthy) and clinical care (using data more effectively to help patients manage conditions such as diabetes). Through its Apple Health app and the ResearchKit and CareKit application development software frameworks, Apple has been creating a software infrastructure for wellness care, diagnostic care, and medical research on Apple devices such as iPhones, iPads, and Apple Watches. So far the real action for Apple is occurring on the provider side for clinical care. For instance, as reported in Forbes, in February 2015, Ochsner Health System in New Orleans launched its “Hypertension Digital Medicine Program,” which relies on HealthKit to empower patients to measure and share with the provider their own blood pressure and heart rates. Oschner adjusts (in real-time, if needed) patients’ medications and lifestyle counseling based on the findings. Apple Watch and iPhone are the delivery devices for Apple’s health management software. The iPhone gives Apple an installed user base of 101 million users in the United States, and the Apple Watch a wearable, which is key for managing everyday fitness goals such as nutrition and exercise (because of the convenience of wearables). But consumer usage is only part of the story for Apple Watch — the other is institutional uptake. Hospitals such as Johns Hopkins University and King’s College Hospital in London are using the Apple Watch to do everything from giving patients reminders to take their medicine to collect information about patients’ epileptic seizures in order to better understand epilepsy. And Apple is collaborating with the health payer side, too. Recently, Aetna announced that the insurer is providing the Apple Watch at no cost to its 50,000 employees “who will participate in the company’s wellness reimbursement program, to encourage them to live more productive, healthy lives.” Aetna is also developing health apps integrated across multiple Apple devices ranging from the iPhone to Apple Watch to handle a host of health management functions ranging from refilling prescription orders to paying for health treatment. 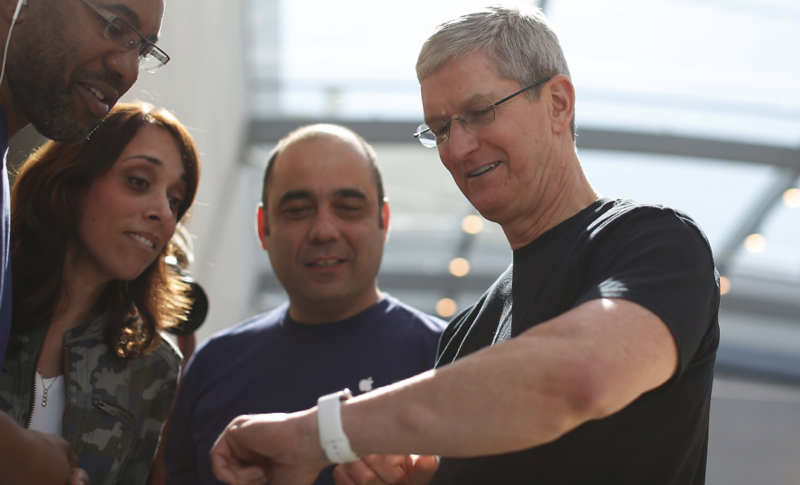 Look for Apple to continue to develop the Apple Watch as a fitness and telemonitoring device. Last year, Apple filed a patent to make the Apple Watch capable of monitoring your heart beat and warning you of an impending heart attack. And recently Apple filed a patent to embed into smart sensors into Apple Watch wrist links. In doing so Apple identified fitness-monitoring capabilities as a potential application of the functional band links. These applications of Apple technology are taking hold for some overlapping reasons, including the advent of pay-for-performance models (in which physicians are rewarded for achieving successful patient outcomes as opposed to volume of patients treated) and the rise of wellness care. The adoption of pay-for-performance models and an increase in high-deductible insurance plans are contributing to a bigger focus on wellness care — in other words, investing in programs intended to keep patients healthy. The PwC’s Health Research Institute (HRI) cites wellness care as one of the top five forces shaping the future of healthcare industry over the next decade, with wellness accounting for $276 billion of the $5 trillion U.S. healthcare ecosystem. The Apple Watch and Apple Health position Apple well here. In other words, healthcare providers need access to better data to help patients achieve better outcomes, which is exactly why Ochsner Health System in New Orleans jumped all over Apple’s HealthKit to start treating hypertension. A sustained effort to making clinical care more effective requires better management of electronic health records, which is what Apple is aiming to provide, as seen with its acquisition of Gliimpse. We’ve gotten into the health arena and we started looking at wellness, that took us to pulling a string to thinking about research, pulling that string a little further took us to some patient-care stuff, and that pulled a string that’s taking us into some other stuff,” he says. “When you look at most of the solutions, whether it’s devices, or things coming up out of Big Pharma, first and foremost, they are done to get the reimbursement [from an insurance provider]. Not thinking about what helps the patient. So if you don’t care about reimbursement, which we have the privilege of doing, that may even make the smartphone market look small. And Cook has good reason to be optimistic. Apple’s ace in the hole consists of its toehold among the various players in the healthcare ecosystems, especially physicians, who prefer using Apple products. And the Cleveland Clinic recently rated the Apple Watch as having the most accurate heart-rate sensor. In 2017, I expect Apple to deepen those relationships through joint research and development (as it has done with Mayo Clinic). And to paraphrase Steve Jobs, here’s one more thing: expect Apple to articulate a vision for integrating artificial intelligence and healthcare. The company recently joined the Partnership on Artificial Intelligence, a consortium dedicated to using AI for social good. AI, data, and healthcare are converging. I expect Apple to be at the center of that convergence. This blog post is adapted from my ebook, Dr. Apple Will See You Now. This entry was posted in Apple and tagged Apple, Apple Watch, CareKit, David Deal, EpiWatch, Fitbit, HeathKit, iPhone, Johns Hopkins, PwC, ResearchKit, Superhype, Tim Cook, wearables. Bookmark the permalink.